It’s no secret that modern marketing organisations must quickly adapt to change, possess a wide array of digital marketing skills and, above all else, deliver results. But, in the face of such business turmoil, many marketing leaders are struggling to adapt. Why? Shifting away from traditional org-centric structures to highly collaborative project-centric structures. Empowering individual team members to take on a range of different roles, rather than specialising in only one. Moving from sequential ‘waterfall’ project approaches to rapid delivery of work via agile principles. Oddly enough, many marketing leaders know this but continue to struggle for a variety of reasons. No formalised training program and a huge lack of insight around their team skills proficiency levels. Little is documented, there is no formal mandate or training requirements, no learning paths, etc. The good news…it’s not an unsolvable problem. Performing a marketing maturity and capability assessment. To expedite this step, use the Gartner Marketing Maturity self-assessment tool. This tool will help you plot your marketing maturity across nine disciplines, illustrating the gaps between current and desired states. For your capabilities assessment, document the capabilities your team requires (i.e., social marketing, search, creative, etc.) and associated skills needed in a RACI matrix, highlighting individual and team skills strengths and weaknesses. This information is critical to baseline where you are, identify problem areas, gaps, strengths, and ultimately, helping you shape your training plan and priorities. Defining and operationalising a skills development training program. Marketing leaders must formalise a training program, defining basic proficiency levels and learning paths. 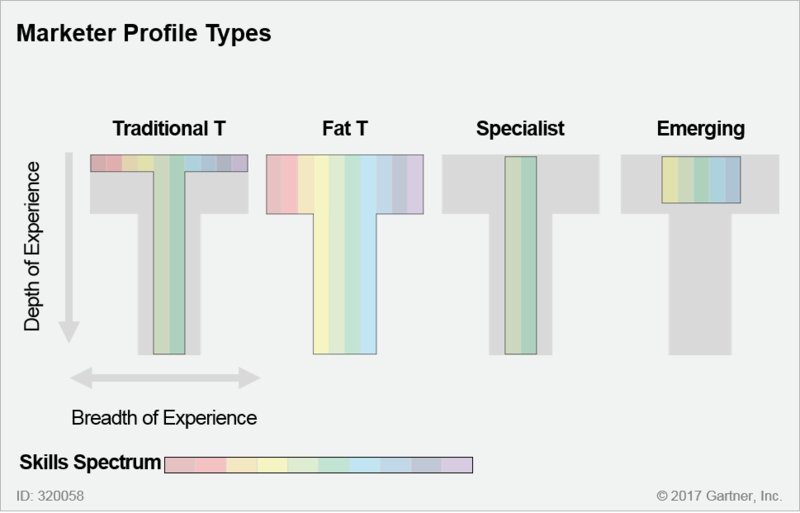 The goal should be advancing your teams marketing skills, both breadth and depth, embracing the Fat T model. See “Designing Your Marketing Team for the Next Decade (Gartner subscription required)” for more information on the Fat T.
In addition to marketing and industry expertise, another key ingredient to team success is soft skills. Qualities such as creativity, resourcefulness and adaptability become the glue that binds skilled talent across teams, functions and partner organisations. Soft skills play a vital role in the success of all modern, agile marketing organisations and underpins the need for team members to be effective problem solvers and have the ability to adjust to internal and external business changes. So, while marketing deliverables loom, don’t forget to invest in your team and their skills. The time and investment will provide you greater flexibility, and fuel your high performance marketing team. * This article is reprinted from the Gartner Blog Network with permission.